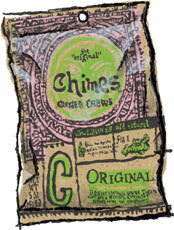 Chimes Ginger Chews Candies for sale. Buy online at Zingerman's Mail Order. Gourmet Gifts. Food Gifts. Grab a Few Chews When You Need a Burst of Flavor. Okay, maybe ginger isn’t exactly brand new and hip. It’s been around for millennia. Yogis used it in India. It’s in all manner of medicines and curatives throughout history across the globe (or at least where it was cultivated). Even today, a bit of ginger tea is the best way I know to settle a grumbling stomach. What’s always amazed me about ginger is how good it tastes in a spectrum of dishes from a dozen different cuisines. It’s just really useful and it tastes really good. That’s why when Emily Anderson, our resident sweets expert at Zingerman’s Delicatessen, started sharing these chews with anyone she’d bump into, I knew they were worth a closer look. No great culinary secrets to these chews, just true ginger flavor (and lots of it). They’re sweet and taste great in the afternoon when you’re looking for a bit of a burst. Try them out after lunch or dinner as a digestive aid. Just keep some on hand wherever you go and pop a couple when the mood strikes.